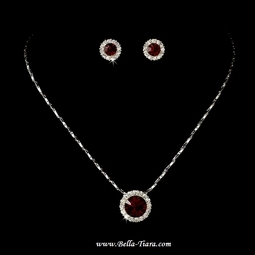 Description: Simple and stunning, this silver plated necklace and earring set features a symphony of sparkling red rhinestones. The perfect accessory to your wedding, prom, or homecoming, this set will dazzle on your special day. The necklace measures 14-1/2" long with a 3" extender and lobster claw clasp. Matching earrings measure 1/2" in diameter. PURCHASE 4 OR MORE PIECES AND RECEIVE 15% DISCOUNT. USE CODE JEWEL15 AT CHECKOUT.